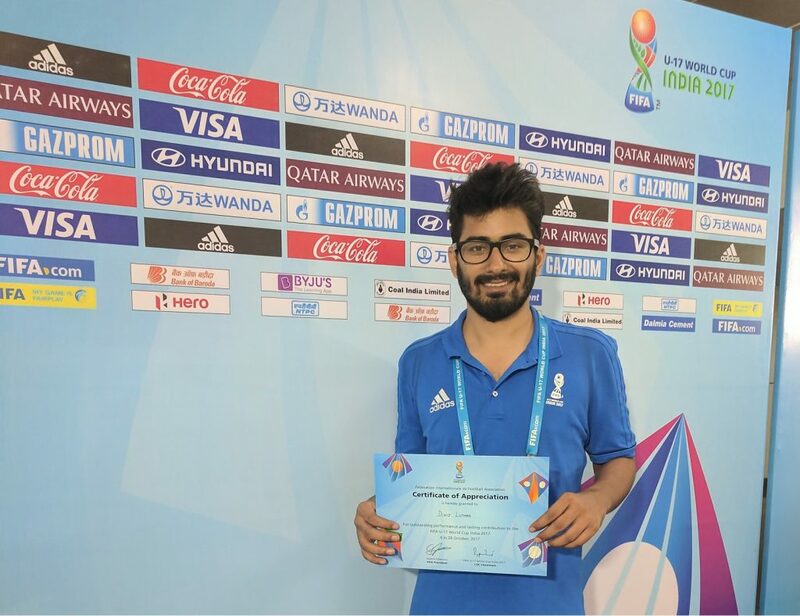 With the football madness in India having relaxed a little following the culmination of its first ever FIFA tournament – the U17 men’s World Cup – in which England beat Spain in a historic 5-2 victory, we touched base with FBA Candidate Divij Luthra who experienced the event from the inside and gives us a glimpse of what the tournament meant for India as well as for his own professional development. Q: This is the first time India hosted a FIFA tournament – what has the reaction been from the local population? A: It has been a record-breaking reaction from the people. I never thought I would see so many football fans coming to watch the games. The event became the most attended in the history of the tournament. Q: India is known the world over to be mad about cricket – which place does football take in society? Have you noticed any differences since the FIFA U17 World Cup started? A: The slogan for FIFA U17 World Cup in India was “Football Takes Over”. The tournament managed to eclipse the total attendance figures of the 2011 ICC Cricket World Cup hosted by India, which shows how many football fans there actually are in India. This event has resulted in a gear change for India and now there’s a lot of investment in infrastructure development, exposure tours, and so on. India is also bidding for the FIFA U20 World Cup 2019. Q: Volunteers are not paid for their work – what motivated you to participate? A: The experience of working in a professional environment and being a part of the history of the first ever FIFA tournament in India, networking with key industry leaders, helping my country make the tournament a successful one and for the love of football. Q: Which industry professionals have you been able to meet during the tournament? A: I was able to network with several senior individuals from organizations such as FIFA, the Local Organizing Committee, Host Broadcasting Services (HBS), the All India Football Federation, and the Sports Authority of Goa – all working in different fields of the football industry. Q: What key points did you learn about event management? A: Time management should be excellent. Good people skills and communication are also crucial. And of course willfulness and passion, as there is a lot of hard work and running around. Q: What key points did you learn about marketing? A: There’s a lot of research required and you need to have knowledge of your competition in order to establish a sense of positioning because you want to spread awareness effectively. Also, you need to have an eye for the small details. Q: Was your experience and the tournament what you expected? A: The experience exceeded my expectations. It was great to see so many football fans coming from different countries, watching the future football stars playing and working with other volunteers. One thing was common – Everyone loves football. Q: In your opinion, what will the legacy be of the FIFA U17 World Cup for India? A: “India delivered a fantastic tournament with a world-class infrastructure” – FIFA lauded India. Infrastructure will be the biggest legacy which will bring more prestigious tournaments to India. Also the Mission 11 Million, a football initiative aimed at taking the game to nearly 15,000 schools in 37 cities across the country in the run-up to the FIFA U17 World Cup, was a great success which planted many strong seeds for the future or football in India. Q: In your opinion, what are the next steps for football in India? A: Football at the grassroots level in India has been largely neglected and untapped. In my opinion, it’s time to help the talent realize its potential and help in overall development of an individual. India needs to keep improving infrastructure and ultimately create a larger market for the sport while generating jobs. Q: You are positioning yourself as a future football industry professional; how will this experience help you get closer to your objectives? A: This experience has given me the confidence of working in a professional environment. Coming as a volunteer, working hard, becoming the group leader of the marketing volunteer team, and being the single point of contact for the LOC’s marketing head proved me that hard work and passion will help me become a future football industry leader. Divij Luthra is a Candidate of The FBA’s Professional Master in Football Business, expected to graduate in August 2018. He can be contacted via LinkedIn.